In movies, L.A. is always getting its comeuppance. But now it’s not the only city defying nature. You’ve seen Los Angeles burning in the movies. But a video shot from a car on the I-405 early Wednesday morning was as apocalyptic a view of my city as in any disaster film. 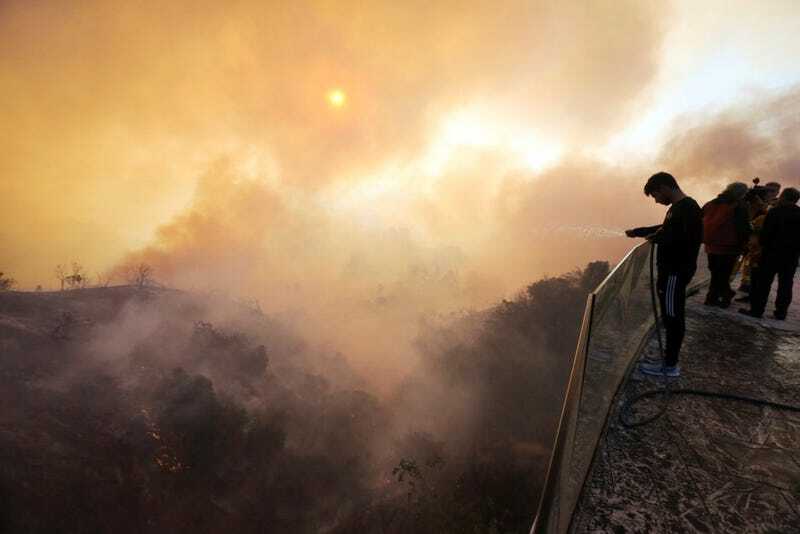 Along the dry edge of the Sepulveda Pass, where the country’s busiest freeway bridges the Santa Monica mountains, a brush fire is roiling acres of houses, museums, and religious centers. Thousands have evacuated; many structures are already in flame. A few miles downhill, in the San Fernando Valley, soot is dusting my childhood home. But the main culprit of these fires is the Santa Ana winds—powerful, withering gusts of air that lash down from the high desert to the coast nearly every autumn. They turn embers into high-intensity blazes notoriously difficult to battle. This year, surface temperature changes in the Pacific have created a pressure gradient especially conducive to the winds. Southern California experienced twice as many Santa Ana days as usual in October; December typically brings 10 such days, and by the end of this week, the region will have already had 6. Undoubtedly, California’s fires have lessons for urban planners: Some of the foothill communities burning this week have recently developed further into the wild-land interface, inserting homes into fire-prone areas. Zoning and other land-use policies may need to be reexamined, among other ways leaders must prepare for and mitigate the effects of an always-burning future, as the warming atmosphere fans Santa Ana flames. But today, as the world watches Los Angeles burn, the view is not only familiar from the movies. Every city is now examining itself in the face of climate change and its companion threats of sea level rise, devastating storms, and extreme heat. Where should we be building and rebuilding? Who gets to live here, and how should we live? These are no longer questions that haunt only residents of L.A., where a rapprochement with catastrophe has long been part of the civic contract. New York, Boston, D.C., and the rest are looking at themselves in the mirror, too; in a sense, all cities are defying nature now. Laura Bliss is a staff writer at CityLab, covering transportation, infrastructure, and the environment. Her work also appears in the New York Times, The Atlantic, Los Angeles, GOOD, L.A. Review of Books, and beyond.